Hey everyone! I'm so excited about the recent cool down in the weather that I've been getting a little a head of myself in outfit's that I'd like to share. I just get so excited to put together fall outfits, that I have more outfits to post than I can keep up with. 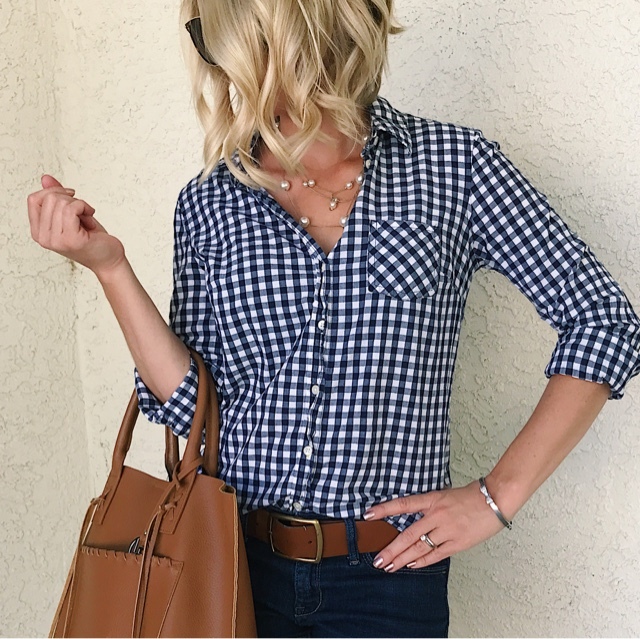 That's why today I needed to back track a little to this cute transitional fall look that I put together a month ago, wearing my gingham button down shirt. I love this gingham shirt. I feel like gingham is just one of those closet staples that you should have. It's so perfect year round, but I especially love wearing it in the fall. Because our falls in Las Vegas are still pretty warm, I like to wear my button down with my jean shorts. I also like to wear it with jeans and as the weather gets cooler, I like to layer it with a cardigan over. So fun to transition into fall!! It's still in the upper 80s here, too so we're still in shorts!